Note: The songs on this album represent certain fantasies that might have been entertained by a young man growing up in the remote suburbs of a northeastern city during the late fifties and early sixties, i.e., one of my general height, weight and build. D.F. 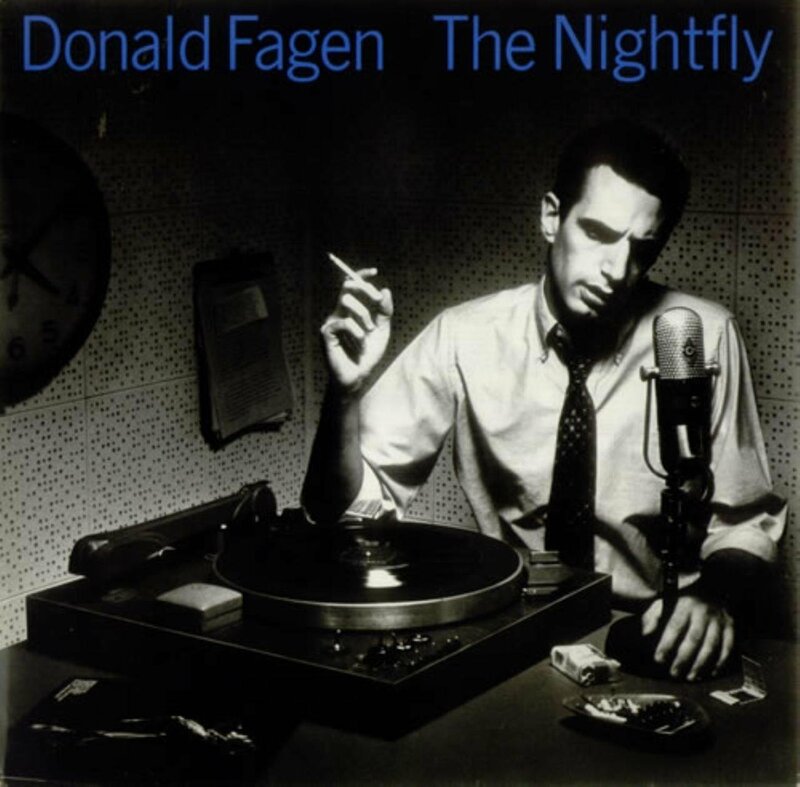 To the extent that he has an image, Donald Fagen’s will always be defined by the cover of his 1982 debut solo album The Nightfly – a super-cool late-’50s hipster miraculously still around in the present day, spinning jazz records and smoking endless cigarettes long into the night (the time on the clock to his right reads ten past four). Fagen’s accidental memoir, Eminent Hipsters, suggests that he pretty much was the young man whose persona he adopts on The Nightfly: a precocious wannaBeat in love with the culture of jazz and outsiderdom; “sentenced to a long stretch at hard labour in Squaresville” but not yet the hip sophisticate he needed to be to fully escape it. The Nightfly is the work of a man approaching middle age, looking back on his younger self and the world he grew up in with fond affection. Compared to Steely Dan, Fagen’s old band, it’s almost cuddly. True, it’s the creation of a well-read and impressively self-educated man who doesn’t mind making you work a bit (the video for New Frontier wisely doesn’t assume its audience will know who Tuesday Weld or Brubeck were, or what Ambush is, or how you might wear a French twist – note that the girl in the video does not have one), but the mood is friendly and warm. After the bitterly cynical and ultimately tragic Gaucho (the final Dan album, from 1980), The Nightfly is probably the only music Fagen could make without driving himself crazy. New Frontier shows he’s still the incorrigible craftsman of old, though. There are beautiful little details all the way through it: the way the backing vocalists hang on the last word of every line, making each terminal word into a hook; Fagen’s hilarious enunciation of “wingding” (how many other lyricists would have chosen that word over the more prosaic “party”? ); the guitar playing of Rick Derringer and Hugh McCracken; the little riff the backing vocalist in the right-hand channel does on “Brubeck”; the tone-cluster piano squonk just before the guitar solo; the contrast set up in the lyric between the bright optimistic future the singer imagines for himself (studying design overseas, of course) and the suburban nuclear paranoia he’s living in right now. Fagen is a guy with warm memories but a clear-eyed view of his atomic-age youth. As he doubles down on what I hope is merely his crusty-old-geezer routine in his new Rolling Stone tour diary (his Eminent Hipsters tour diary is, while very funny, also very crusty), it’s refreshing to relisten to The Nightfly and certain songs off Aja (the title track, Deacon Blues, Josie) and hear a Donald Fagen that meets the world with neither a defiant snark nor a cane raised in the air. This entry was posted in Music and tagged 1950s, 1970s, 1980s, Aja, Ambush, Dave Brubeck, Deacon Blues, Donald Fagen, Eminent Hipsters, French twist, Gaucho, hipsters, Hugh McCraken, jazz, Josie, nuclear paranoia, record production, records that sound great!, Rick Derringer, solo albums, Sound recording and reproduction, Steely Dan, the Beats, The Nightfly, Walter Becker, wingding on April 8, 2015 by rossjpalmer.